The Grimthorpe Handicap Chase is well established as a trial for the Grand National. 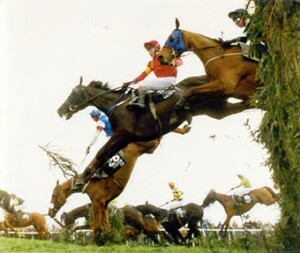 There are several entries for Aintree in action this weekend, the most notable of which are Monbeg Dude are Godsmejudge. Monbeg Dude won the Welsh National at Chepstow last year and is being aimed at Aintree this year. He was due to run in the Haydock Grand National Trial recently but was pulled out at the last minute as he wasn’t quite right. If that minor setback hasn’t affected him, he looks sure to play a leading role in this race. He has been brought along steadily this season but put up the best performance of his career to win at Cheltenham last time out. Held up by Tom Scudamore, he moved through sweetly to outpace the favourite Theatre Guide on the run-in. The handicapper has put him up 8lbs for that impressive victory but he could be open to further improvement. Paul Carberry rode him at Chepstow and can be expected to delay his challenge for as long as possible. Godsmejudge won the Scottish National last year and would be among the favourites here but for a disappointing run at Sandown last time. There is a valid excuse for his poor display as the Alan King stable were under a cloud at the time. Shortly afterwards, he shut down the stable for a few weeks to clear a virus. Emma Lavelle’s Court By Surprise finished second to There’s No Panic in the London National in the race in which Godsmejudge disappointed. That was a gallant effort from Court By Surprise but it may be significant that the other placed horses have been well beaten in their subsequent races. Monbeg Dude could be the best value bet at 6-1 with Bet365. Paul Nicholls has not enjoyed the best of luck in the big races recently and has two entries here. Mon Parrain was second in the Topham Chase at Aintree in 2011 but has lost his way completely since. He is yet to win over this distance and has only raced twice in the past two seasons. Stable companion Harry The Viking is another attempting to bounce back to form after a long losing streak. He showed a glimmer of his old form when third last time and could run well off bottom weight. Night In Milan and Mart Lane were very disappointing last time and may struggle in this grade. Golden Call was a convincing winner last time out but this is a big step up in class for the ten-year-old. Wayward Prince has a touch of class but looks to have a stiff task with 11st 12lb while Storm Survivor is a difficult ride for Richie McLernon. Real Milan has ground to make up with Mart Lane on previous form here and was a beaten favourite at Wetherby last month.